Today is Thursday, for most folks in the US, they are eagerly anticipating their first big weekend of the Summer, Memorial Day weekend. My brother took off yesterday for the River and won’t be back until next wednesday. But for me, I stay in Orange County, ignore BBQ invites and other attempts to lure me away from my 3rd biggest social weekend of the year…. Yes, I have a personal fetish for men wearing kilts, with my biggest preferrence in punk men in kilts. Thus the annual pilgrimmage down the 55 freeway to Costa Mesa on Saturday and Sunday of Memorial Day weekend. 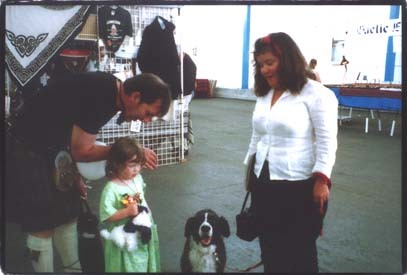 Pipe and Drum band competitions, large men in sports kilts tossing things, cute sheep dogs attempting to round up sheep, small children dancing, big exhibition halls filled with booths, bad British food and lots of beer for those who drink it, and the spectacle of it all. Yep, that is the best part. The spectacle of it all. Men of all shapes, sizes, ethnicities (don’t have to be Scottish), and ages, all wearing kilts. God bless ’em. 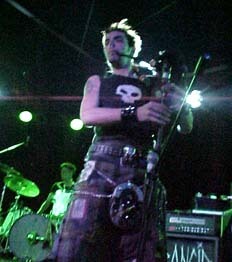 Top photo of the Real McKenzies by Jen; photo at 2002 Scottish Games by Erika. by Ms. Jen on Thu May 22, 2003 | Permalink | fun stuff.